Quinn & Partners’ Francisca Quinn & Tony Pringle were at the GRESB North America events in New York last week. Here they share insights from the Real Estate and Infrastructure Assessment results and how companies can act now to get ahead. The Global Real Assets Sustainability Benchmark, GRESB, recently released the 2018 results of its widely adopted Real Estate and Infrastructure Assessments. Key takeaways: investors value environmental, social and governance (ESG) disclosures and the process helps funds and entities to improve sustainability strategies and performance. Here is a summary of the results and what they mean for you. Nine years into the survey, GRESB covers the majority of public and private real estate investments around the world. Participants represent 61% of global listed real estate equities and 75/100 top private equity firms and property companies. The infrastructure sector’s uptake of GRESB after three years is similar to real estate. The real estate industry has succeeded in engraining sustainability in executive oversight and business management. Most entities score above 75% on Management & Policy. The focus is now shifting to data quality and improving resource efficiency and portfolio sustainability metrics. These are the areas where leaders now differentiate themselves in GRESB. Driven by regulation, the infrastructure sector typically has good data at the site level. However, operating companies need to aggregate data across their sites to manage ESG as a business issue, set targets and report environmental and social impacts to investors. Data also enables sustainability certifications, which is an opportunity for both real estate and infrastructure assets. The Taskforce for Financial Climate-Related Disclosures, TFCD, recently reported that 500+ major financial institutions have articulated support for its disclosure recommendations. In other words, it’s fair to say that investors and executives consider climate risk material. This year, GRESB reported that 114 companies answered the voluntary resilience questions and this demonstrates that companies are also paying attention to climate risk and associated issues like extreme weather, renewable on-site energy, Paris Accord-aligned carbon targets, etc. In closing, GRESB has become the global standard to benchmark and disclose sustainability performance in real assets. GRESB allows investors to assess funds and companies in their efforts to outperform and mitigate downside risk. Many investors also believe that ESG signals quality. We may soon see indices tracking the stock performance of GRESB participants versus the market. This high-quality benchmark is founded on real information – lots of it. It can be tempting to not think about GRESB until Q2 next year, but that’s a major missed opportunity. Get started now! Use your results to focus your efforts on addressing gaps over the next six months – whether it is engaging with stakeholders, collecting more data or setting a target. Embrace the opportunity to stay ahead of the ever-increasing GRESB benchmark. Quinn & Partners supports leading institutional investors, real estate and infrastructure companies with ESG integration and GRESB audits/assessment services. In 2018, the value of all Real Estate and Infrastructure Assessments that we submitted on behalf of our clients was CAD 210 billion, which is equivalent to 10% of all North American responses. Please reach out to Francisca Quinn, Managing Partner, Quinn & Partners, at +1 416 300 8068 for more information. IPPSO FACTO – the magazine of the Association of Power Producers of Ontario (APPrO) requested that Quinn & Partners contribute to its August 2017 issue. In this article, Francisca Quinn provides information on greening corporate portfolios and the advantages of long term Power Purchasing Agreements (PPAs). Last week, Quinn & Partners’ Tony Pringle was in New York City for the annual GRESB results release. Here he reports on GRESB’s continued growth and explains how your company can use the survey to create business value. GRESB – the Global Real Estate Sustainability Benchmark – has increased 20% annually since it launched in 2010. In 2017, 850 companies and funds participated, representing 77,000 assets and $3.7 trillion in real estate value. Although North America still lags behind Europe in number of participants, it has almost three times the asset value, demonstrating that the assessment is well established in Canada and the US. In public markets, GRESB participants represent the majority of market value, covering 54% of North America, 70% in Europe, and 50% in Asia-Pacific. To fill in the gaps, GRESB now scores non-participating companies based on publicly disclosed Environmental, social and governance (ESG) information. Although these scores are not as robust, they give investor members a full market picture. Including disclosure from non-participants also allows GRESB to compete with other ESG ranking organizations. Since GRESB’s suite of assessments also includes real estate debt and infrastructure, it provides investors a one-stop-shop for ESG data in real asset portfolios. GRESB’s continued relevance is driven in large part by investors. GRESB is supported by 66 investor members, representing $17 trillion in assets under management – more than double the value of last year’s GRESB members. In a survey of these investor members, 94% stated they use GRESB data in their investment process, and two thirds stated they either mandate or strongly encourage participation from all the funds they invest in. But transparency still trumps performance for investors: Only 35% of investor members set performance targets for GRESB, and these targets relate to participation or year-on-year improvement. This was the opening statement from James Kennedy, Managing Director of Asset Management at JP Morgan Chase at last week’s results release. Kennedy’s view was echoed by the sector leaders, demonstrating that investors alone aren’t driving GRESB participation. Curiosity, competition and companies’ desire to find business value appear to be equally important. This sentiment was echoed by the sector leaders, who provided examples of how they turn GRESB questions into business value. Prologis, who’s conversations around tenant engagement have led them to develop a customer sustainability advisory council, is a prime example of innovating GRESB questions into business value. “Internal conversations initiated by GRESB participation have made Boston Properties a stronger, more purposeful organization.” – Ben Meyers, Manager of Sustainability at Boston Properties. Checking off a box in the GRESB survey doesn’t deliver value – that comes from developing an approach and executing a program to address a material industry E, S or G topic. GRESB’s true value, then, lies in using the survey as a change management tool to spark internal discussions and action plans around topics such as sustainable development, health and wellness, climate risk and resilience and tenant and community engagement. These are issues that span across departments. For example, conversations on industrial property data with one client led to collaboration between property management, leasing, communications and operations to engage industrial tenants and green the standard lease. As more companies strive for GRESB leadership and check off more boxes, differentiation comes with execution, not score. “The test is getting harder” according to GRESB’s head of North America, Dan Winters. The leadership pack is getting more crowded as companies advance their practices and the assessment will change more in 2018 as a result. Questions on sustainability management will dig deeper to identify companies with more sophisticated sustainability governance. Some of the questions from the voluntary health and wellness assessment will be integrated into the main survey. And there will be greater emphasis on providing property level performance data. Having supported 12 GRESB submissions in 2017, with 10 Green Stars and one country leader, Quinn & Partners has learned a few tricks to improve score results and identify business value. For more information, please contact Tony Pringle (tony@quinnandpartners.com). Tony Pringle is a Co-founder and Partner at management consultancy Quinn & Partners. He is Quinn & Partners’ lead on Global Real Estate Sustainability Benchmark (GRESB) services for real estate, infrastructure and mortgage investors. He is also a member of multiple GRESB Technical Working Groups and supports GRESB training. Francisca Quinn was proud to join a group of leading sustainability and real estate professionals in contributing content to Chapter 5, Sustainability in Real Estate, of “Canadian Commercial Real Estate: Theory, Practice, Strategy”. 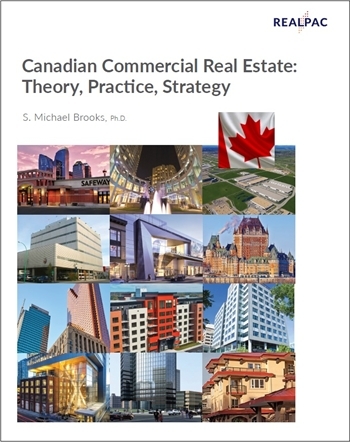 The textbook was published in 2016 by the Real Property Association of Canada (REALPac) and written by its CEO, S. Michael Brooks. 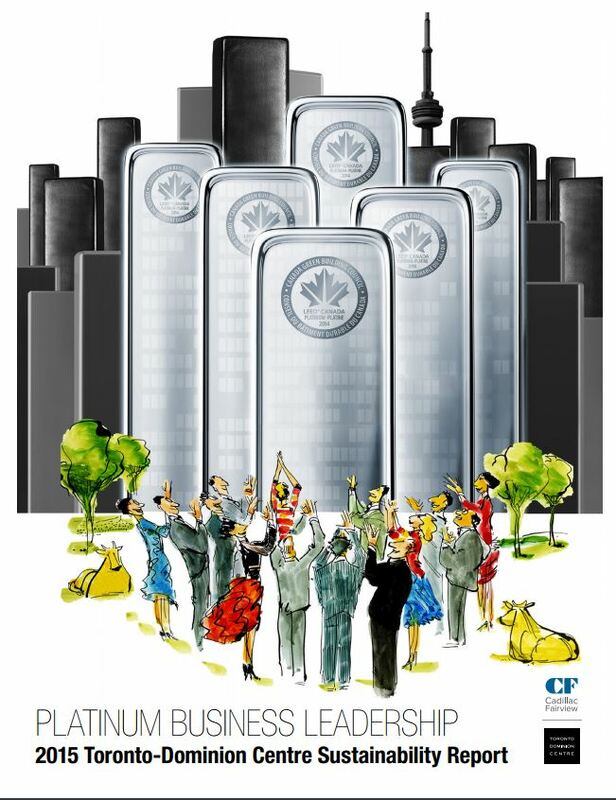 It is the first comprehensive literature on Canadian commercial real estate. Chapter 5 provides a thorough overview of the evolving context of sustainability in commercial real estate. Specifically, the chapter explains material sustainability impacts of the real estate industry, green building certification and sustainability disclosure. The textbook is currently used at Ryerson University in its real estate project capstone course. For the past three years, Quinn & Partners has supported the Healthcare of Ontario Pension Plan’s (HOOPP) Leadership in Environmental Advancement Program (LEAP). LEAP convenes senior representatives from HOOPP Real Estate’s investment and management partner companies and consists of a conference, innovation pitch and awards ceremony all centred around sustainability leadership. After attending LEAP in 2015, executives from one of HOOPP’s management companies were motivated to commit to a sustainability strategy for the company which is in place today. In 2016, that company set energy reduction targets for all its properties – across all client mandates. LEAP has been recognized by several prominent awards, including being named a Clean50 Top15 Project for 2016. LEAP also won the NAIOP REX Green Award of the Year for 2016. The Quinn & Partners team has advanced knowledge and experience of the Global Reporting Initiative’s (GRI) Sustainability Reporting Standards. This reporting framework is used by thousands of reporters in over 90 countries, making GRI the world’s most widely used standard on sustainability disclosure. We believe that alignment with GRI Standards indicates best-in-class sustainability reporting. The foundation of GRI-reporting is a comprehensive stakeholder engagement process (also known as materiality assessment), which is used to determine what sustainability issues are most important for a particular organization. We have supported clients with materiality assessments and compliance with GRI G4 Guidelines and the most recent GRI Standards. Quinn & Partners team members have supported the Cadillac Fairview Corporation with its GRI reporting strategy since inception and collaborated on its Corporate Responsibility Reporting for multiple consecutive years. 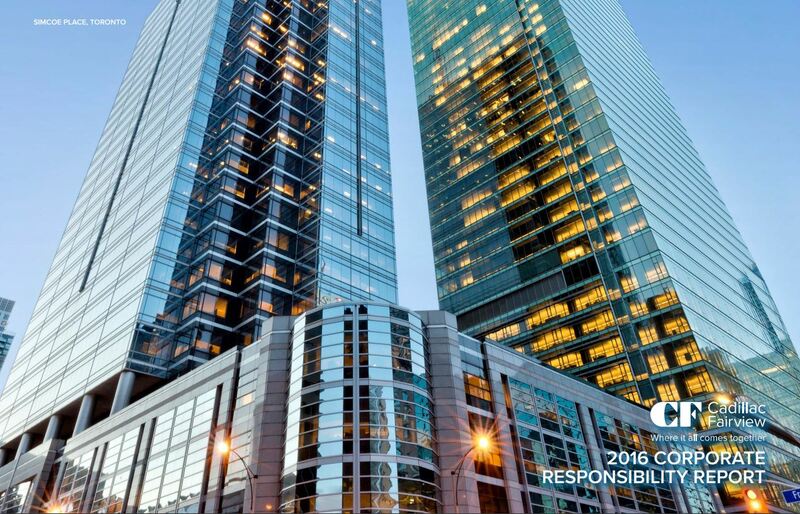 Its first GRI G4 2015 Corporate Responsibility Report was one of the most thorough and transparent reports published in Canada. In 2016, Cadillac Fairview came out among the first Canadian GRI Standards reporters. 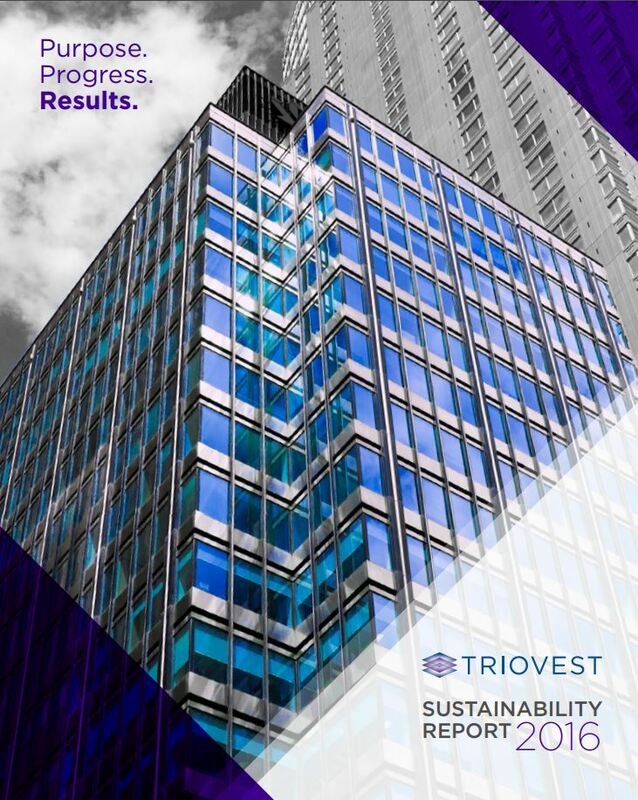 Our team has provided sustainability reporting advisory services to Triovest Realty Advisors on its reporting process and report content since their inaugural report. This has enabled Triovest to develop one of the first GRI G4-aligned reports published in the Canadian real estate industry in 2015 and one of the first GRI Standards-aligned reports in 2017. 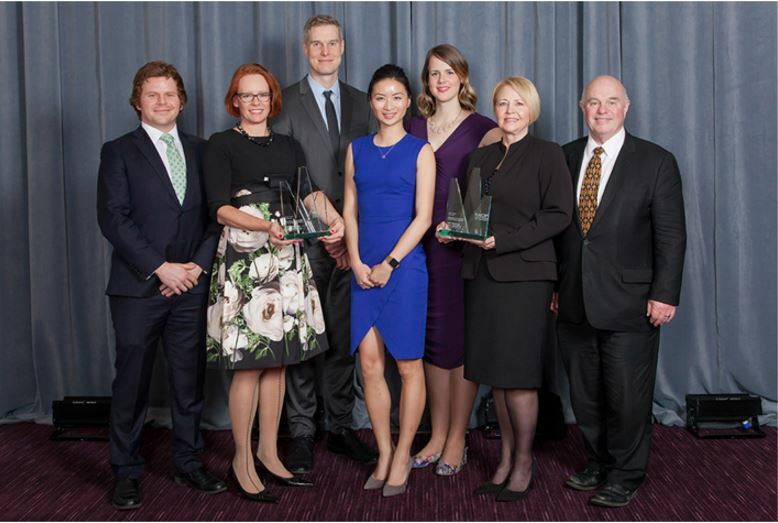 Triovest’s reports have been recognized as industry best practice. 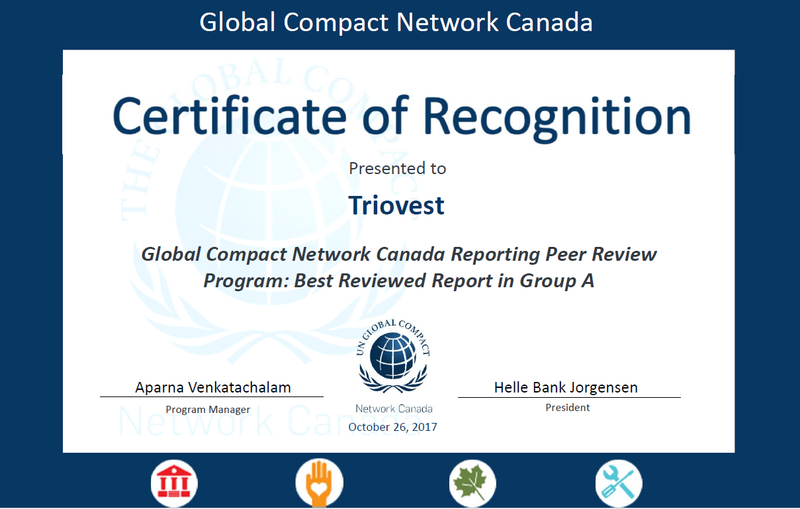 The Global Compact Network Canada recognized Triovest’s 2016 Sustainability Report as a 2017 Best Peer Reviewed Sustainability Report. Triovest’s stakeholder research was featured in BOMA Canada’s 2015 BOMA BEST National Green Building Report. 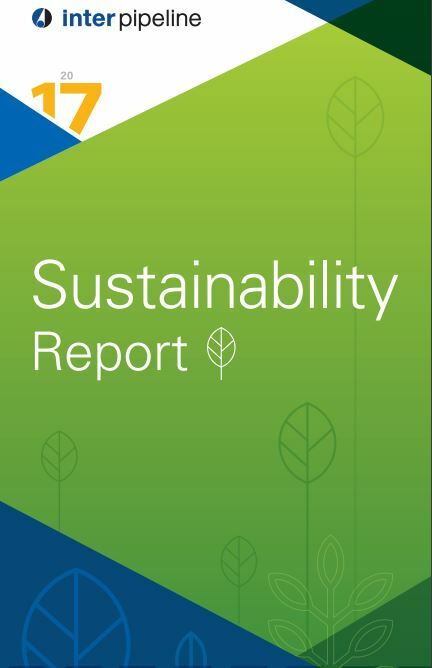 The inaugural sustainability report was a runner up in the international Corporate Register 2017 CR Reporting Awards. In 2017, Quinn & Partner team members supported Inter Pipeline with their inaugural Sustainability Report. The report makes GRI-referenced claims to help stakeholders compare the company’s performance with industry peers. Organizations do not benefit from keeping sustainability achievements “their best kept secret”. Quinn & Partners provides sustainability reporting advisory and production services. For public disclosures, we follow global standards, such as GRI, and support adherence to other leading frameworks such as PRI, SASB, CDP, DJSI, GRESB and the Taskforce for Climate-related Financial Disclosures (TCFD). 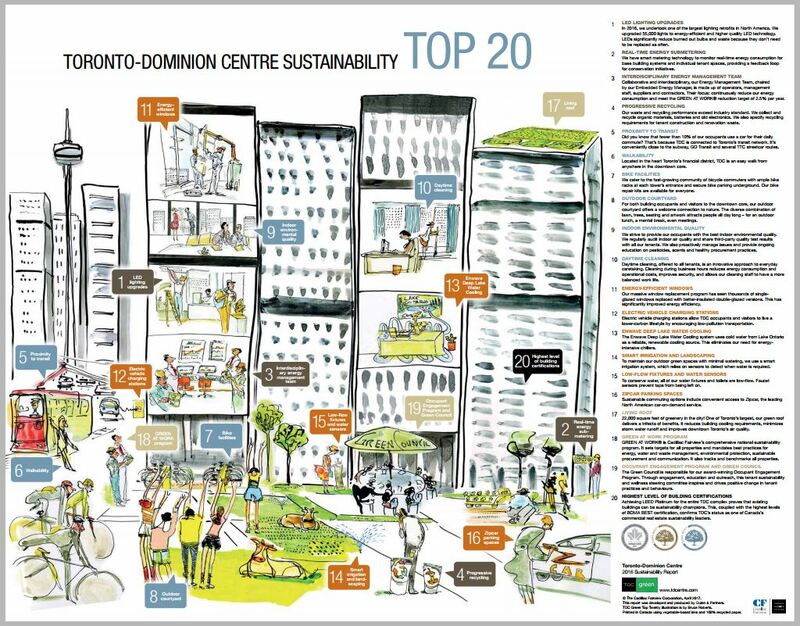 In 2012, the Cadillac Fairview flagship office complex, the Toronto-Dominion Centre (TDC), became the first individual North American property to produce a stand-alone sustainability report. Our team has supported TDC with its sustainability communications since its start. TDC sustainability reporting centres on how the company creates value for its tenants’ financial, human, real and brand capital and it has been recognized at industry conferences and in the media. Quinn & Partners is proud to be a trusted advisor in TDC’s pursuit of sustainability leadership and innovation. 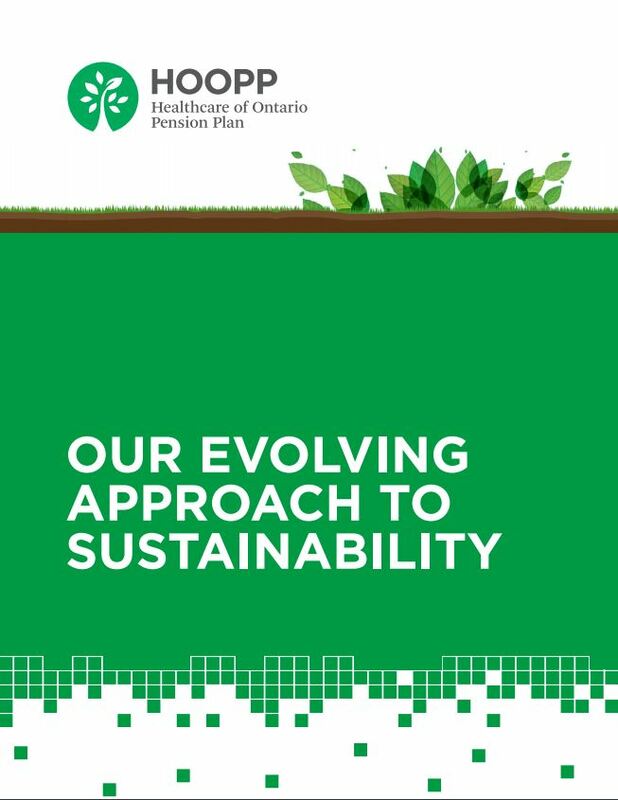 As a sustainability advisor to the Healthcare of Ontario Pension Plan (HOOPP), our team has played a leading role in its sustainability strategy development, program execution and performance reporting. 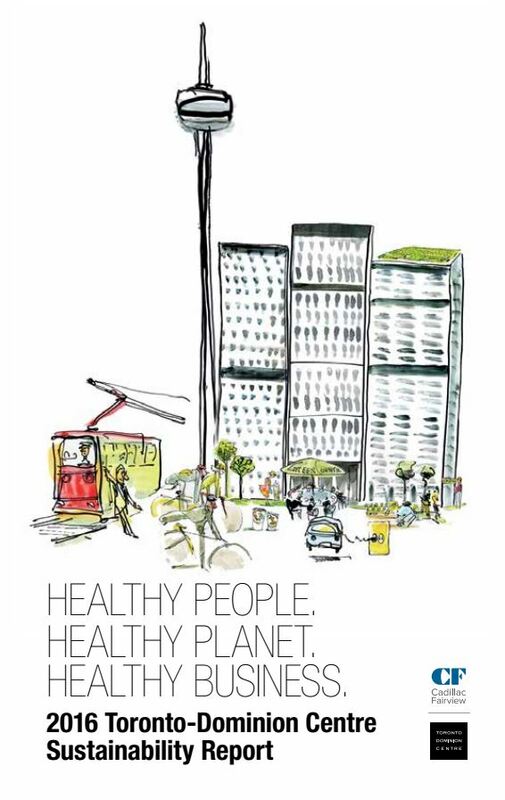 HOOPP Real Estate publishes an annual sustainability report. 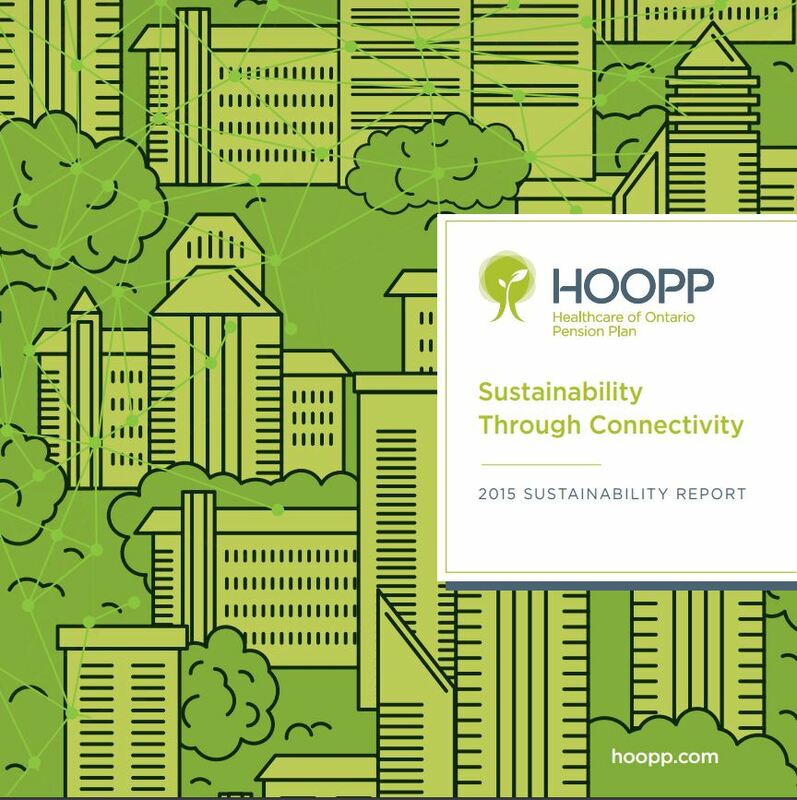 Its 2016 report, “Our Evolving Approach to Sustainability”, examines the maturation of HOOPP’s sustainability program and the evolution of sustainability in real estate. Dream Unlimited is the parent company of three large real estate investment trusts, land and development companies and a renewable energy trust. 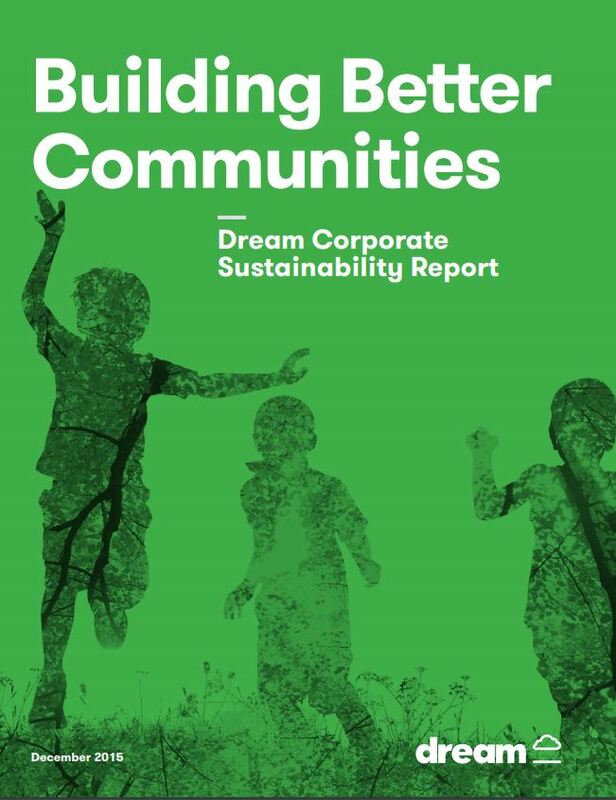 The company’s inaugural sustainability report, Building Better Communities, details Dream’s achievements in the areas of the environment, employee engagement, community building and sustainability governance.